Born 1945 in Helsinki, Finland. Married with one daughter. Education: Dipl. ekon 1969 (Master of Science in Business Administration and Economics) from the Svenska Handelshögskolan in Helsinki. Lives in an apartement in Helsinki wintertimes, and in an old summerhouse in the Aland Islands (situated between Finland and Sweden) summertimes. -One year as photoeditor at Lehtikuva Oy (Sanoma Oy), Scandinavia’s biggest newspaper company. -For 12 years chief of auditors at the Board of Customs (Excises and Company revenues). -For 30 years owner and CEO of Borgship, a shipbroking company dealing with small vessels in Finland. Only Finnish vessels, not to conflict with interests of the Board of Customs. -For 4 years shipowner of an oceangoing cargoship. -Published 5 books about Finnish cargo and navy ships (The ‘ Laivastokalenteri’ books). -For 20 years (1960’s and 1970’s) maritime correspondent for Jane’s Fighting Ships in London with the Soviet Navy as speciality. -Inventor and always interested in big machines and therefore also interested in UFOs. -Finnish coordinator for Olmos’ FOTOCAT since 2007. 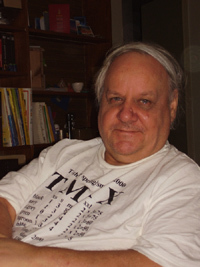 -Member of FUFORA – the Finnish national UFO organization – and voted its Chairman since 2009. He’s currently acting as Chief of Investigations as well. -The Finnish TV-Channel FST5 has been filming him now for 3 years for a documentary about him and his organization FUFORA. The documentary will air in 2012. -Numerous interviews for different newspapers and radiostations, the latest of which has been published on 28/12/2011 by the newspapers Helsingin Uutiset, Länsiväylä, Vantaan Sanomat and Kiuruveden Lehti, while the following day he was interviewed by the radio station Radio Nostalgia in Helsinki. This entry was posted in Profiles by author1. Bookmark the permalink.